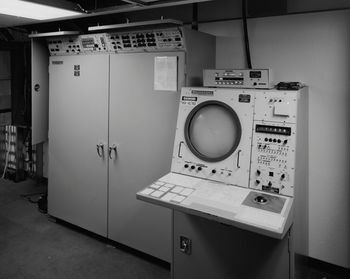 FYQ-47 - A joint use USAF/FAA Radar Video Data Processor (RVDP), used at joint use radar sites as the FYQ-47, and to FAA only sites as the FYQ-49, built by Burroughs Corporation. Known as the Common Digitizer. The common digitizer program began in the 1960s with the development of the FYQ-40 as a small set of prototype machines. In 1967, two of the FYQ-40s were sent with two BUIC II systems into the Vietnam War theater, one at Monkey Mountain and the other at Udorn RTAFB. The FYQ-40 was second generation (transistor) electronic equipment. The FYQ-47 program was implemented in the late 1960s and early 1970s to replaced the aging FST-2s that were rapidly becoming unsupportable. The FYQ-49 was a version of the FYQ-47 without the height-finder interface and was deployed to FAA sites without separate height-finder radars. The FYQ-47 and FYQ-49 were integrated circuit single channel radar data digitizers. In February 1973 the Air Force and the FAA completed an 18 month replacement program, swapping the aging vacuum tube FST-2s with integrated circuit FYQ-47s and FYQ-49s. The Air Force purchased a total of 83 common digitizers at a cost of $16 million dollars. The FAA purchased an unrevieled number of slightly different and smaller versions for civil air traffic control at a cost of $ 11 million dollars. On 6 Apr 1979 the FAA announced the award of a contract for a second generation common digitizer (CD-2). The CD-2 was to be dual channel and microprocessor driven. The contract was for 106 of the CD-2s to be installed at long range radar sites. The FAA commissioned the two first CD-2s in March 1986 and the first units were were delivered to radar sites in May 1984. This page was last modified 09:25, 25 February 2018 by John Stanton.